Our top priority at Event Productions, Inc. has always been to create an environment that allows you to be as successful as you can, while maintaining an easy and user-friendly service. Take a look at what we have to offer. Whether questions or concerns, or inquiring different options available to you, our staff will gladly help you with all of your needs. We have a full time staff available by phone or email as well as a concierge station at each event for your benefit. We provide everything to create the perfect exhibit for you. We will walk your through from your first consultation to your eye-catching final product at show site. We also offer a variety of premade exhibit templates. Our in-house graphics team allows us to offer our graphic design and printing services at a very competetive price. Our team offers printing services including, but not limited to: foamcore signs, banners, posters, freestanding signage, modular units, back-lit, custom exhibit printing, clings, carpet graphics, and more. If we don't offer it, we will figure out how to get it for you. Looking for help with setting up anything at the show? Event Productions offers skilled workers. 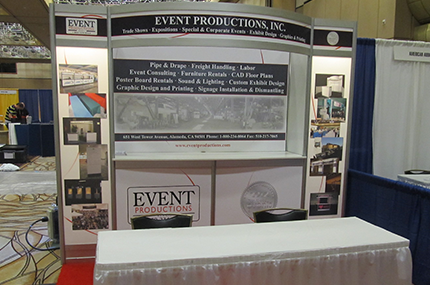 Event Productions, Inc. provides freight handling services to all exhibitors.